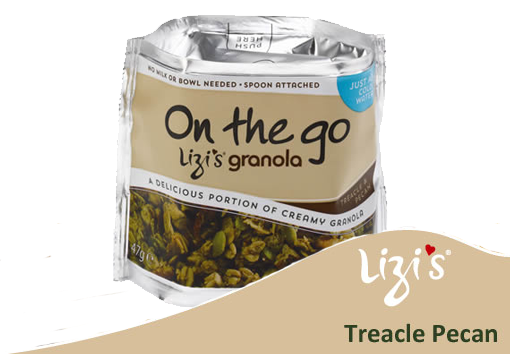 Lizi's Granola reached out to me and gave me the opportunity to review their newest product, Treacle Pecan on the go. Unfortunately I was on my Whole30 journey, so I asked my friend Laura (who reviewed some muesli for me last year) to try it out. Thanks Laura! Product ingredients: Jumbo Rolled Oats, Lactose-Free Dried Milk (15%), Rapeseed Oil,Desiccated Coconut, Fructose, Pecan pieces (4%), Black Treacle (3%), Oligofructose, Pumpkin Seeds, Sunflower Seeds, Golden Linseeds,Natural Flavouring. Even though this product contains milk, the levels of lactose is low (< 150 ppm), making it suitable for people with lactose intolerance. Pretty neat for a filling meal on the go! As a lover of Granola was really keen to try this new product. However, I must admit I was slightly apprehensive about the dried milk as I usually have yogurt with my cereal. The Granola was tasty but maybe a little bit too sweet for my liking however the milk was actually ok and not as alien as I was expecting! I think if you like tasty hearty breakfast cereal this is definitely one to go for, I really was full up until my lunch which would co-inside with the low glycaemic index of this cereal. I loved that the packaging comes with a little spoon which is super handy if you are in a rush or having to eat breakfast at work. I am someone who likes to take my time over breakfast so would probably not buy this product normally however I would be keen to try other Lizi products as the cereal was fab. Overall I would give it 7/10. A box of 12 sachets is £12 plus P&P. Lizi's Granola was kind enough to give me this sample. I was not paid for this review. All opinions are honest (and of my friend, Laura).